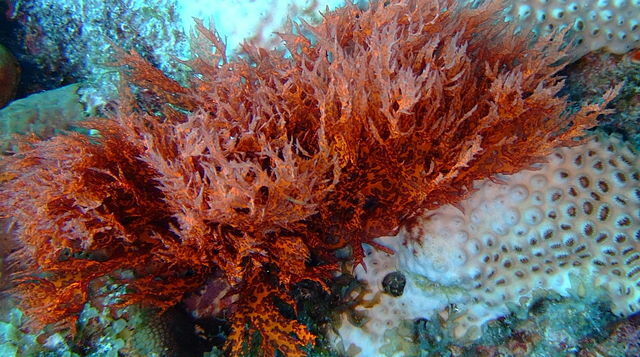 Carrageenan is a soluble fiber extracted from Irish moss (Chondrus crispus) or red marine algae (seaweeds) . It is a mixture of indigestible carbohydrates, polysaccharides composed mainly of galactose. Carrageenan cannot be digested by human intestinal enzymes and probably not broken down (fermented) by beneficial large intestinal bacteria, so it is not likely absorbed and probably provides no calories . Based on its gelling ability, carrageenan is divided into three commercial classes: kappa (rigid), iota (soft) and lambda (form gels only if mixed with proteins). The US Food and Drug Administration (FDA) allows the use of ammonium, calcium, potassium and sodium carrageenan in foods . Carrageenan may be used as a thickener and emulsifier in chocolate milk, almond milk, coconut milk, soy milk, coffee, hot cereal beverages, ice creams, yogurts, cottage cheese, whipping creams, fruit jellies, soft drinks, ham, salad dressings, sauces, infant formulas, dried pasta products, pate, processed meats, fish products, vegetarian hot dogs, liquid and frozen egg products, salt substitutes, sugars and syrups, beer and fermented vegetables. It can be also used in medicines, laxatives, toothpastes, shampoos, personal lubricants. In the European Union, carrageenan is labeled as E number E407, and Processed Eucheuma Seaweed (PES), which is a semi-refined carrageenan mixed with cellulose, as E number E407a . There is INSUFFICIENT EVIDENCE about carrageenan supplements effectiveness in prevention or treatment of cough, bronchitis, tuberculosis, peptic ulcers, constipation, other intestinal problems, or in promoting weight loss . According to the US Food and Drug Administration (FDA), undegraded or food-grade carrageenan is Generally Recognized As Safe (GRAS) for use in foods , but the same FDA has suggested further investigations of its safety . The problem is that food-rated (undegraded) carrageenan might become degraded and thus cancer-forming (cancerogenous) during the food processing or breakdown in the human stomach , but currently there is no evidence that carrageenan would cause cancer in humans [10,12]. Side effects. There seems to be no reports of any significant side effects of carrageenan. Allergic reactions to carrageenan are possible . Pregnancy. Carrageenan, in amounts typically found in foods, is safe to use during pregnancy and breastfeeding, but not enough studies have been done to evaluate its safety in larger amounts . Infant formula. In 2014, the Joint Expert Comittee on Food Additives at FAO/WHO (JECFA) “concluded that the use of carrageenan in infant formula or formula for special medical purposes at concentrations up to 1000 mg/L is not of concern” . NOTE: Degraded carrageenan (polygeenan) is not permitted for use in foods. In animal studies, degraded (molecular weight < 50,000 Da) carrageenan has often caused gastrointestinal ulcers and cancers [1,10]. Carrageenan in combination with drugs for a high blood pressure (captopril, hydrochlorothiazide, etc.) may cause a low blood pressure, and in combination with drugs that decrease blood clotting (aspirin, clopidogrel, heparin, warfarin, etc.) it may cause bruising or bleeding . 1. Is carrageenan vegan and gluten-free? Is carrageenan-free chocolate, almond or soy milk available? Yes. Here is one list of carrageenan-free products. In November 2016, the National Organic Standards Board (NOSB) of the US Department of Agriculture (USDA) has removed carrageenan from the list of approved substances in foods labeled as “USDA Organic” .